"Farm Fresh Fiber" where you "Know Your Yarn"
Since the late 1990's I've run a small NJ farm producing 100% USA made, one of a kind fiber products. Most of my animals are rescues or seniors living full happy lives. 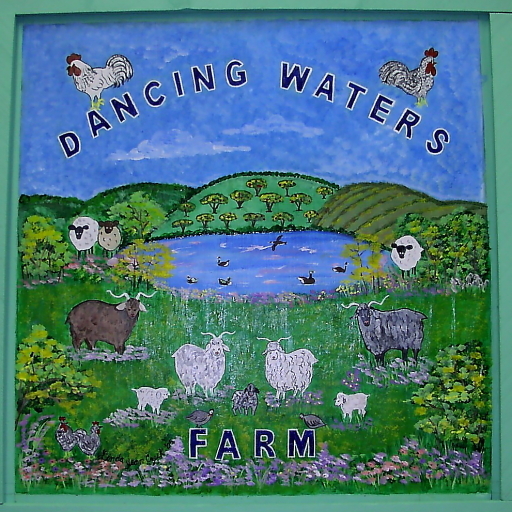 All products are made using my animal's fiber or combined with other small USA farmer's fiber. Hand made in Hunterdon County, NJ with machine processing at small USA mills. Designed for handhooking or weaving night skies - divine! 41% mohair - 59% Shetland wool, dark blue, purple, black with yellow highlights. How about a hand made yarn bowl filled with a skein of luxury farm fresh yarn? 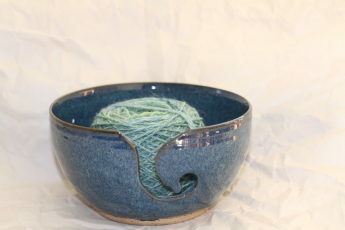 Here's a skein of Aquatics hand dyed yarn paired with a Wendy Clay blue yarn bowl for inspiration! Lots of useful info on carpet beetles and clothes moths. Spoiler: prevention does involve vacuuming your closets at least once a year, preferably more often YIKES! According to a recent new release by the American Physical Society “Knitting is a periodic structure of slip knots.” Elisabetta Matsumoto has been using math to describe properties of textiles/ fabrics such as stretchiness based on knitted stitches. These formulas may ultimately be applied to biological tissue replacements such as cartilage or tendons. 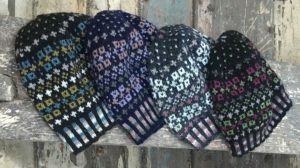 Info on the 2019 Roadside Beanie pattern designer. These look adorable if a bit painstaking to make. The recipe is a vegan version of the old time favorite. Will give them a try but not sure I’ll have the time to do the shapes and drawn on frosting! This is from our friends at Promote Shetland – what will they come up with next? A new study has confirmed that wearing superfine Merino wool helps ease the symptoms of eczema and improves the wearer’s quality of life. Professor Joe Fowler at Dermatology Specialists Research in Louisville, Ky., undertook this two-year study assessing the effect of Merino base-layer fabrics on 50 of his patients with mild-to-moderate eczema. Using a cross-over design, participants were placed in two groups. The first group was dressed in their regular clothing for six weeks and then changed to superfine Merino wool garments. The second group began with the superfine Merino wool for six weeks and then crossed over to their regular clothing for the final six weeks. Each patient undertook an initial visit to establish their baseline condition, followed by regular visits until completion of the study. They were assessed for clinical, physiological and quality of life outcome measures. Significant decreases in eczema symptoms from Baseline to Week Three were seen in both groups. However, those who switched to Merino wool at Week Six experienced a further significant decrease in symptoms, in contrast to those who switched to regular clothing. 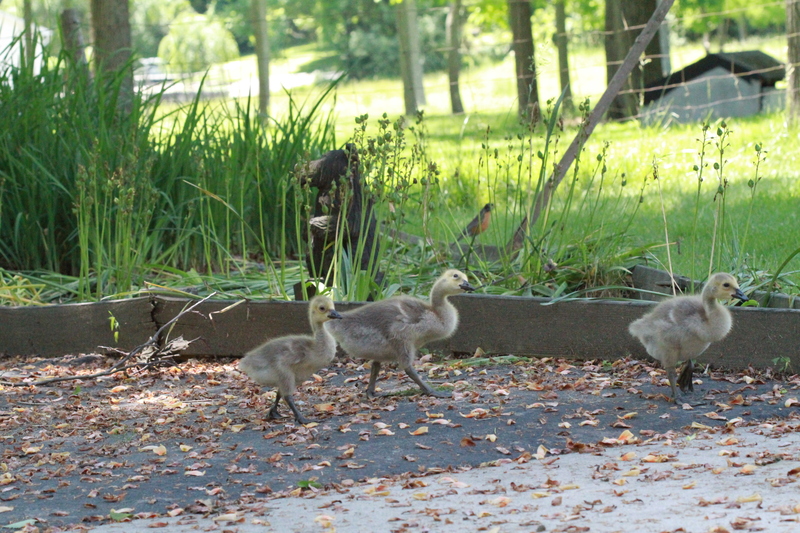 Further, “it was only when Merino wool was worn that improved quality of life scores occurred,” Fowler said. Outdoor Online recently published an article about the Peruvian immigrants who work as shepherds on the last large-scale sheep-herding operation on Washington state’s public forestland. It’s likely that the wool in your outdoor gear came from these 4,000 sheep, owned by the family ranch S. Martinez Livestock, near Mabton, Wash. The wool goes to companies such as Farm to Feet, Pendleton, and Woolrich to be turned into American-made performance clothing. 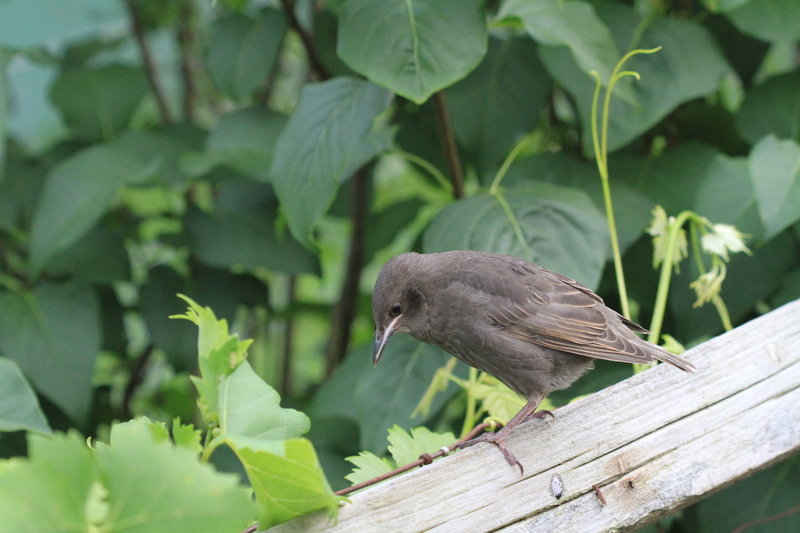 Check out the outstanding photography. The Martinez family immigrated to American from Spain in 1920, starting as sheepherders and becoming ranch owners. Today the operation has diversified into fruit, cattle and grain as well as continuing the sheep operation. They have a lot of issues to resolve due to grazing on public lands! They’ve been successful by staying in touch with the Federal government and private landowners to avoid impacting bighorn sheep, being impacted by protected wolves and avoiding wildfire areas. The free pattern is online! We are thrilled to announce this year’s Shetland Wool Week patron as Shetland knitwear designer and handspinner, Elizabeth Johnston. The news was officially launched this morning at the start of the Edinburgh Yarn Festival, where Shetland Wool Week has a stand. The annual SWW hat pattern, which is now synonymous with the launch of the patron, was also released. This year’s official hat pattern is called ‘The Merrie Dancers Toorie’ and was designed by Elizabeth Johnston. The hat is based on a fisherman’s kep in the Shetland Museum and Archives’ Boat Hall, and features three small patterns, but is not a Fair Isle design. Elizabeth has lived in Shetland all her life, and like many others who grew up in the islands, has knitted from childhood. Elizabeth bought her first spinning wheel in 1978, which changed her focus from knitting to spinning, and also teaching these skills. She eventually started her own business, Shetland Handspun, which has taken her to many places around the world and she is in high demand as a speaker and instructor. We are delighted to have Elizabeth as our new patron. She has a life-time of knowledge about Shetland wool, learned from those who came before and honed through practice. Centuries of Shetland textile craft come together in her work: sheep-rearing, wool processing, dyeing, spinning, knitting, weaving. Perhaps more importantly, she is passing on her skills and knowledge to others through practice-based teaching, just as Shetlanders have always done. The Merrie Dancers Toorie pattern can be downloaded for free here or come along to our stand at EYF and pick up a printed copy. Elizabeth will be splitting her time between the SWW stand and also her own stand, Shetland Handspun, so drop by and say hello. The pattern will also be available from the Shetland Museum and Archives shop and textile outlets in Shetland. 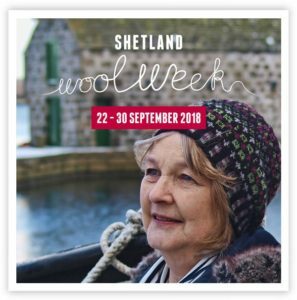 Knit the hat in any of the suggested colour variations, or come up with your own colour scheme, and wear it to Shetland Wool Week 2018 – identify your fellow Wool Weekers and compare hats throughout the week and at the official SWW 2018 photograph! The photo says it all. 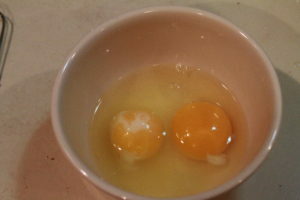 Had to buy eggs for holiday baking as my ladies are still molting (so not producing many eggs at the moment).